Hit the open road – but not literally. 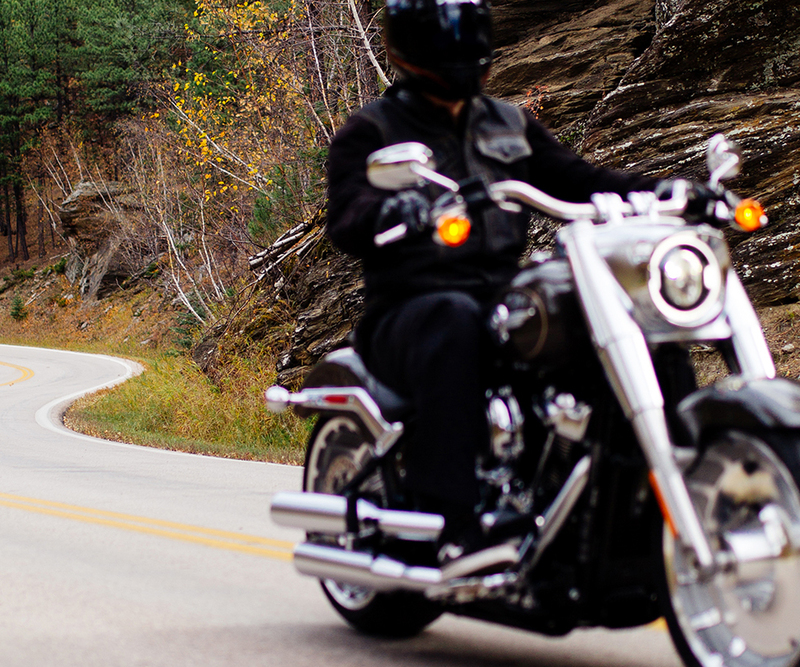 Riding a motorcycle comes with thrills and challenges all its own. Knowing the right way to ride can save your hide in a hairy situation. Give yourself extra distance and time to react. Signal in advance, and incorporate arm turn signals. Avoid speeding, weaving between lanes or making sudden maneuvers motorists can’t predict. Don’t pass on blind corners or where visibility is limited. If you’re new to an area, review riding maps before you go. Constantly scan the road for wildlife and other hazards – deer come out of nowhere. Know how to handle your bike in varying conditions including wind, rain, snow, fog, gravel/sand, work zones or other uneven surfaces. Remember that motorists have trouble seeing motorcycles; always assume you’re invisible on the road. Be aware of car and truck blind spots, and don’t ride in them. If you think a motorist might not see you, beep up and use your horn. Ride in the part of the lane where you’re most visible. Avoid the center of the lane. Make sure your headlight is on day and night, and use reflective strips on clothing. Flash your brake light to warn motorists before slowing down and stopping. A large percentage of motorcycle crashes happen at interchanges. Watch for turning vehicles, especially those turning left. Make sure passengers are educated on riding and wearing the right safety gear. A passenger’s extra weight changes how your bike reacts. Adjust for extra stopping time, avoid excessive speed and use more finesse when accelerating. Passengers should hold on tight and avoid making any sudden movements. Ask your passenger to stay sitting straight when turning, simply looking over your shoulder in the direction of the turn instead of leaning. If you’re riding in a group, avoid lane sharing and use a staggered formation to give your bike space. Know that drugs and alcohol affects more than your judgment; they also skew your balance and coordination, which are essential on a bike. A crash due to impaired riding doesn’t just hurt you. It takes a life-changing toll on family, friends, employers and more. Even if you don’t crash, the costs of impaired riding are serious, including jail time, arrest, losing your license and/or motorcycle and other large expenses.